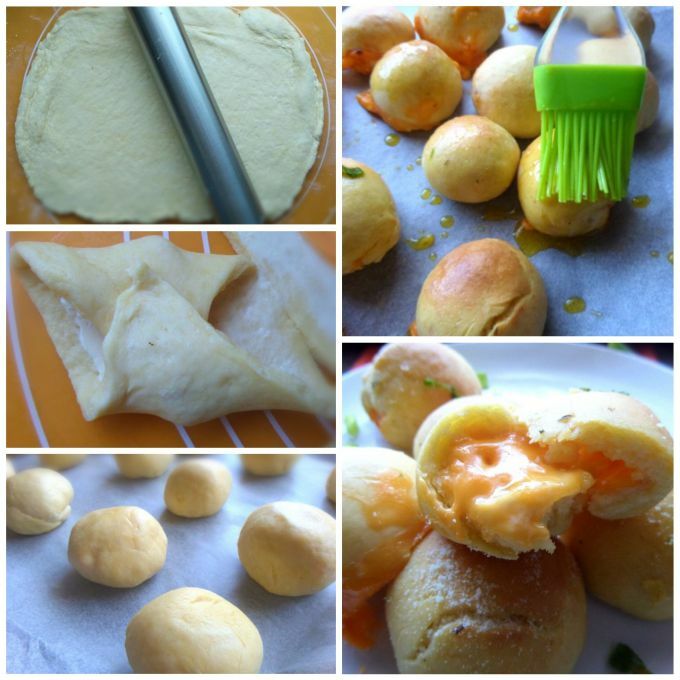 Three Cheese Garlic Puffs with Homemade Dough, a great recipe to add to your appetizer platter. 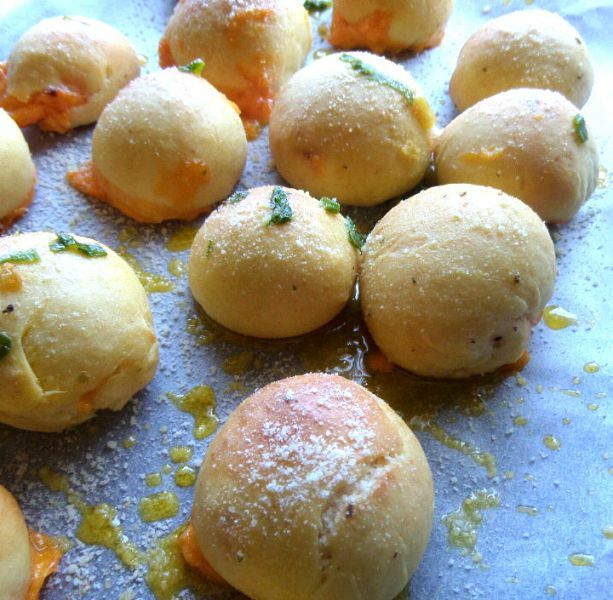 A buttermilk rich crust, filled with cream cheese, baked and then brushed with a garlic herb butter and rolled in parmesan, watch these delicious little bites disappear off the plate in record time. 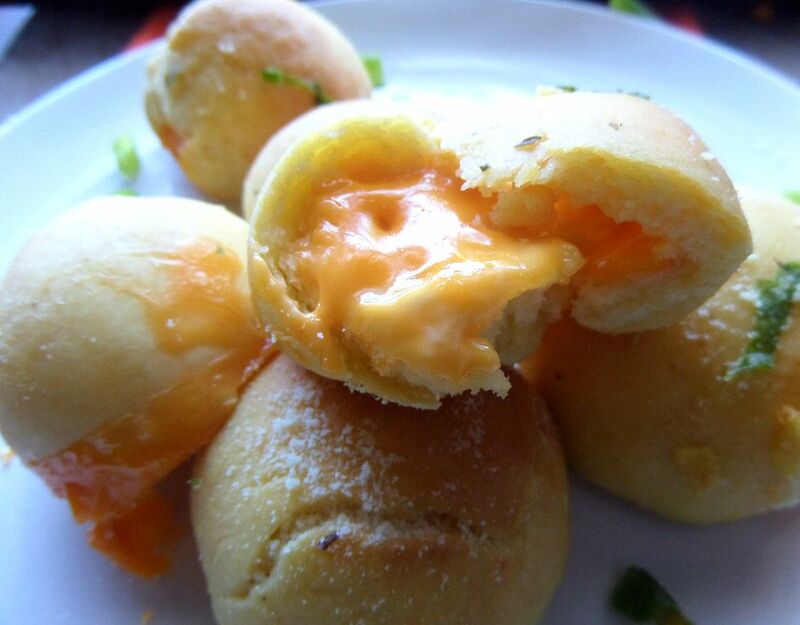 Many recipes use refrigerated biscuit or premade dough when making cheese bombs and because this type of dough is not available in some countries, this makes a great recipe option. The dough does not have yeast, and there is no kneading….in fact it is really quick and easy and takes just 5 minutes to make the dough. It is important not to overhandle the dough, just mix and gather the dough together. Overmixing will result in a tough and chewy dough and that is not a good idea at all. The dough is then refrigerated for about 10 minutes, rolled out into a 20×30 rectangular shape and then cut out into 20 little squares. Each square is spread with a bit of cream cheese and a piece of cheddar or mozzarella is placed in the square, folded and rolled into a ball. It is then baked, removed from the oven and brushed with garlic butter and rolled in finely grated parmesan. Super easy and delicious. These are actually best served warm. Here in my home, these do not even get the chance to reach the warm stage, they are snatched off the baking tray after it has been brushed with garlic butter and parmesan and is still piping hot when eaten. 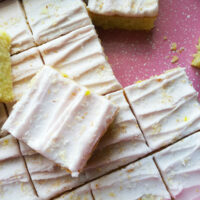 I don’t blame the boys, because our home smells so good when these are baking. It is that irresistible bread/ cheese baking aroma. So yummy. 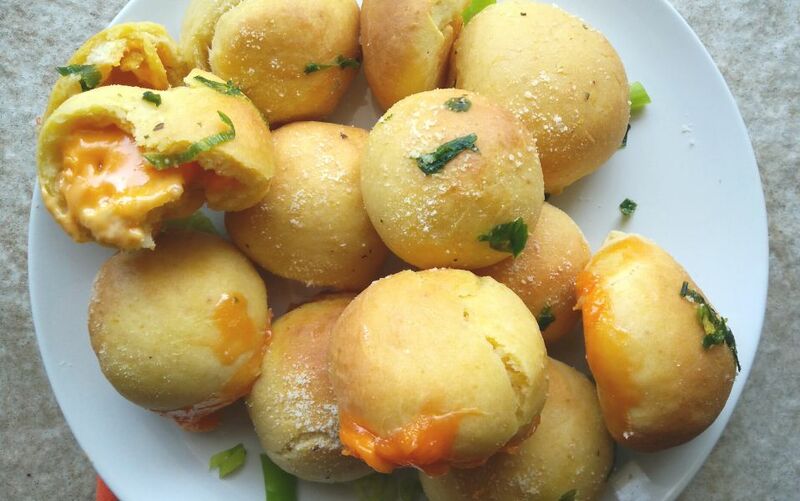 My recipe for Three Cheese Garlic Puffs with Homemade Dough will make a delicious addition to your appetizer platter. A buttermilk rich crust, filled with cream cheese, baked and then brushed with a garlic herb butter and rolled in parmesan, watch these delicious little bites disappear off the plate in record time. In a bowl whisk together flour, sugar, salt, baking powder. Using your fingertips, rub in the butter or margarine. Lightly dust the surface or board with flour and roll the dough into a 30x40cm rectangle. Cut in 20 pieces. 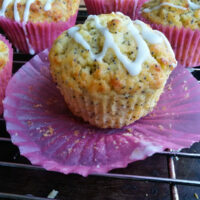 Spread a bit of cream cheese onto each piece and place a cube of cheese onto the dough. Place on a baking sheet and bake for 15 minutes at 180° C / 350 ° F until lightly brown. While it is baking prepare the garlic butter by melting the butter or margarine in a small pan, add garlic, mixed herbs and chopped garlic chives if using and cook for 1 minute. Remove from heat. 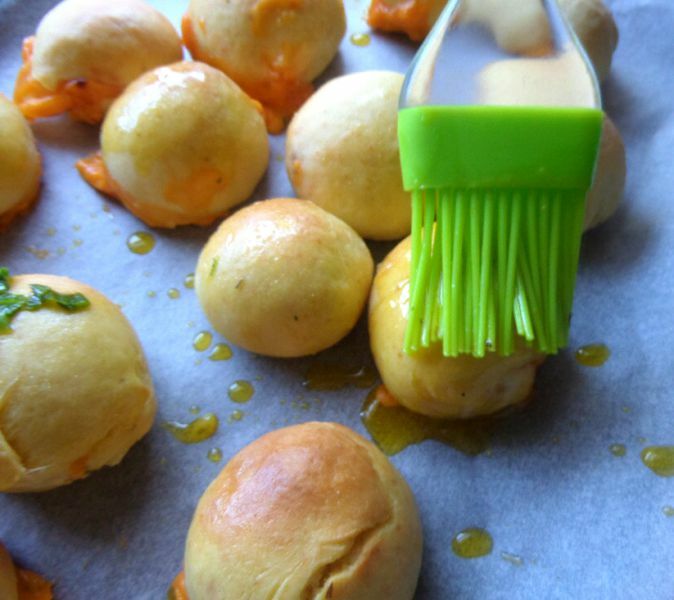 Remove the cheese and garlic puffs from the oven and brush the tops with the garlic butter mixture. Roll in parmesan and serve hot. 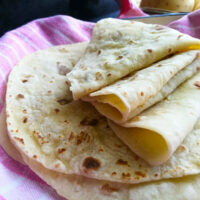 Ashika, I feel like I would eat these as quick as they came out of the oven!!! There is not much I love more than cheese and dough, especially when it’s warm and fresh! These sound so good!! Perfect for a party (but I’d have to make a double batch) 😉 Cheers!
? I know what you mean…they smell so good when they are baking…it really is hard to resist…and I did end up more than one batch because the boys polished it off so quickly ? Happy New Year to you too Angie …Thank you, they were absolutely delicious ? These little bombs of cheese sound amazingly yummy!! Garlic and cheese together are the best comfort food! Perfect finger food for holiday parties! Thank you Deepika….they really are a good combination and everybody enjoyed these snacks so much ? I’m coming over for New Year’s. These look so good! I could easily polish off a whole batch myself :). Happy New Year, Ashika! Your should call these Flavor Bombs!! Because these are so full of yummy goodness! If I was having a New Years Party I would definitely make these!! 🙂 Haha…that is a great name for this recipe. 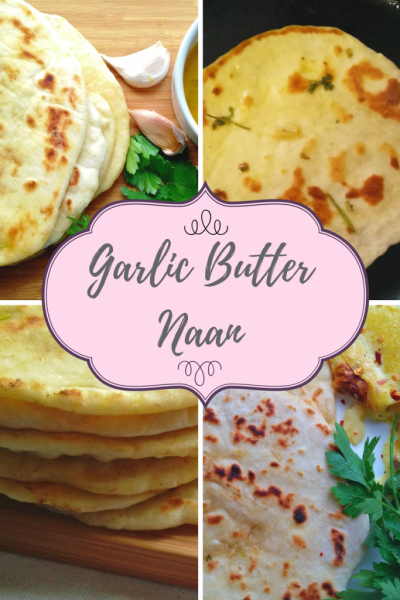 It is so delicious and it is perfect for a party or just a snack too! These look perfectly bite sized and delicious! Love that you make your own dough! We didn’t have a New Year’s party but I think these would be perfect for any party throughout the year! Happy 2018 Ashika! Hope it’s a great year! Cheese, garlic, bread – you’ve included all of my favorites here! Perfect for New Year’s! Thanks for the recipe, and Happiest 2018 to you and yours, Ashika! 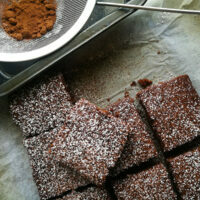 Thank you so much and A very Happy New Year to you and your family too Laura… I am so glad that you like the recipe too. This really is a yummy combination of food and everybody really enjoyed it ? Oh my gosh!! All I need is a romantic comedy, a blanket, comfy place on the couch and a serving of these!! The perfect day! Happy New Year! Take care. 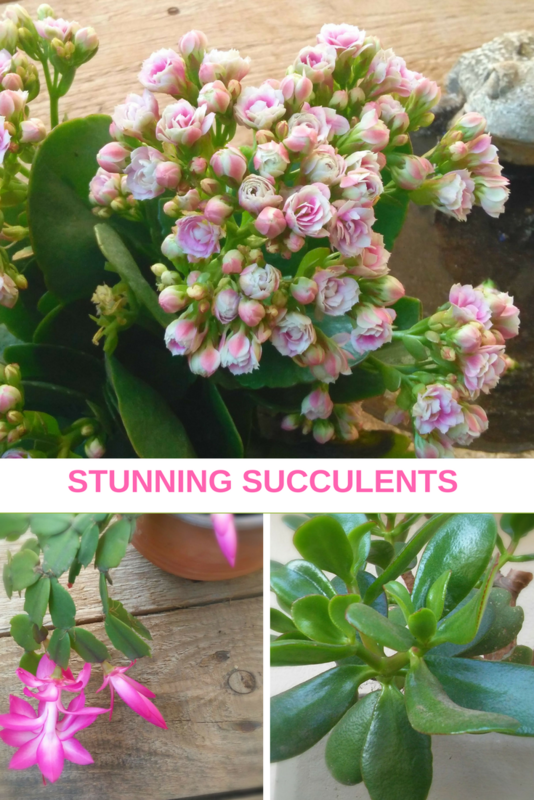 thank you so much For Sharing Dear….